Groomers are expensive, starting in the tens of thousands for small units and the hundreds of thousands for the large snow movers. You may wonder how clubs can afford to purchase groomer and pay for repairs. It’s not easy. The recent Recreational Trails Program Buy America requirement adds a twist to the process. Most of the clubs have turned to the Recreational Trails Program (RTP) as an important component for funding their grooming equipment. My own club could never have put together the fleet that we have without the RTP program. So, is there anything new with the RTP program? Let’s take a look and find out. As it turns out, there is something new in the RTP program. A federal judge’s ruling in January of 2016 has further stipulated that equipment being purchased with Federal High Way Administration (FHWA) funds, or in our case RTP funds, must comply with Federal “Buy America” requirements. Recreational Trails Program Buy America requires that any project involving a purchase of machinery containing any percentage of steel must be able to certify that the steel component of the machine has been melted, formed and manufactured in the USA. Further examples of projects involving steel could be a town that might purchase a tractor, a snowmobile club that might purchase a groomer or a group putting up a steel bridge. The Buy America program does, however, allow for waivers and allow for an exemption if the value of the steel in the machine being purchased is less than $2,500. Anyone needing additional information may refer to the FHWA website or contact the Massachusetts DCR RTP administrator. A few clubs have already encountered this new stipulation. Let me relate what my club’s experience has been. 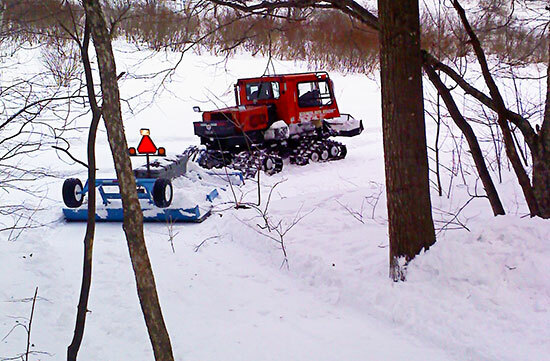 The Mill Valley Snowmobile Club put in a grant request for two new grooming drags. We solicited four quotes from drag manufacturers in both the USA and Canada. The process to obtain certification prior to proceeding with a purchase was taking far too long, so we decided to keep our money local and turned to a local fabricator to make the drags. But first we approached the steel wholesaler, who readily provided the necessary paperwork for compliance, putting us in the “go” position. Compliance was rather easy. I would like to offer special thanks to all of you that help purchase, maintain and drive our grooming fleets. I hope to see you out on our snowmobile trails soon. And, remember, All Snowmobilers are Members of the Grooming Team.